At first glance, a cruise vacation seems ideal for wheelchair and scooter users. Activities, meals, and entertainment are close at hand, attentive staff is available to help and, best of all, once you embark, you are in an accessible stateroom for the duration of your journey. These things are all true, but wheelchair and scooter users do need to spend a bit of extra time planning and doing research before booking a cruise. Here are some cruise vacation issues and solutions to consider. Quality and availability of wheelchair-accessible staterooms vary from ship to ship. Do not assume that an accessible stateroom will meet your particular needs. Will your wheelchair fit? Can you turn it around in the bathroom? Is there a plug near the bed so you can easily recharge your wheelchair or scooter? Be sure the stateroom is truly right for you before you book your cruise. Fix: Contact the cruise line or an accessible travel specialist and ask about issues important to you. Be very, very specific about your requirements. Getting on board your cruise ship is easy when you embark at a cruise pier with level access and elevators. The same cannot be said for ports of call where tenders or gangways must be used. In fact, some cruise lines will not allow wheelchair users who cannot climb steps to leave the ship via tender. Others impose severe restrictions on the use of tenders. Gangways can also be problematic because they are narrow and ridged and because they sometimes must be placed at very steep angles. You will need to read all of the terms and conditions for your cruise line to find out what tendering policies apply to your specific ship. Fix: Choose ports of call that have cruise piers, then contact your cruise line to make sure you will be able to disembark at all of these ports. Plan to be flexible in case port calls must be changed once your cruise begins. Not all shore excursions are accessible, and even those that claim to be wheelchair-friendly need to be carefully investigated. If you normally use a wheelchair lift to get into and out of vehicles, you will need to tell your cruise line that you require a van or bus with a lift. Never assume that "wheelchair friendly" equals "wheelchair lift available." Read your cruise line's terms and conditions to be sure that you will be permitted to go on the shore excursions of your choice. Fix: Clearly communicate your requirements to your cruise line and to your cruise ship's excursion desk once you embark. Plan your own shore activities if no accessible excursions are available. You will want to plan extra time to get to shore excursions, shows, and special activities if there are not many elevators available on your ship or if your cruise ship is very large. It's never fun to miss a planned activity because all the elevators were full. Fix: Choose a cruise ship with plenty of elevators and select a stateroom that is as close to an elevator as possible. 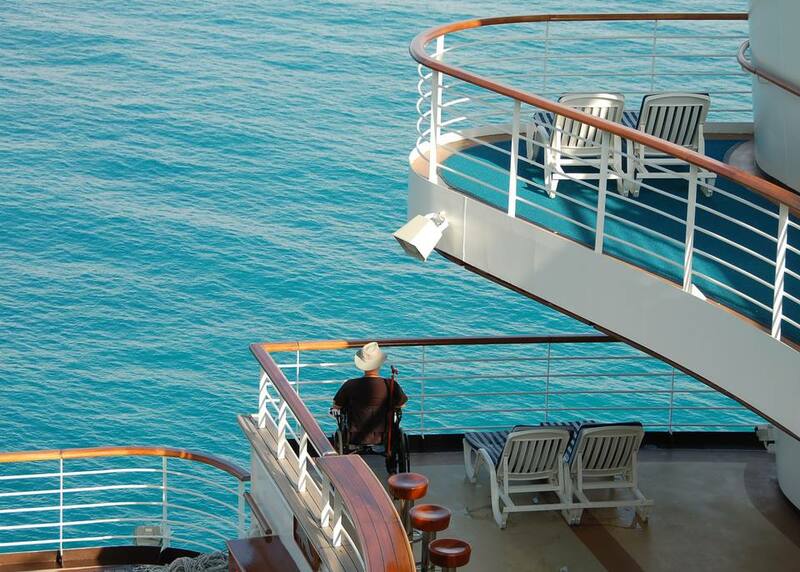 One of the advantages of cruising is that there is always something to do. However, some cruise ships have fewer accessible activities than others. Just because a swimming pool is available does not mean that a person who uses a wheelchair can go swimming; if there is no lift or ramp, wheelchair users cannot get into the water. Seating for shows may be inadequate; while nearly every ship has some type of seating for wheelchair users, it isn't always well-located. Fix: Decide which activities are important to you, then contact your cruise line with a list of specific questions about each one. If accessible seating is limited at shows and lectures, arrive early so you can find a seat easily. If your ship's pool is not accessible, you may be able to find an on-shore pool or spa that offers wheelchair lifts and ramps. Some cruise lines impose wheelchair and scooter weight restrictions or do not permit passengers to bring electric scooters or wheelchairs on board. Others restrict wheelchair and scooter widths in order to prevent problems with narrow doorways. And some, particularly European river cruise lines, do not permit wheelchairs or scooters at all. You may also face the possibility of damage to your wheelchair during your trip. Fix: Read all of your cruise line's terms and conditions before you book. Find out which types of wheelchairs and scooters are permitted. If yours does not meet your cruise line's requirements, consider renting a smaller model during your cruise. Bring a list of wheelchair or scooter repair shops with you; the ship's crew may be able to help with a small, simple repair. Many cruise lines work hard to provide accessible staterooms, activities and shore excursions. Do some research or find a travel agent who understands accessible travel issues, get answers to your questions and choose your cruise.